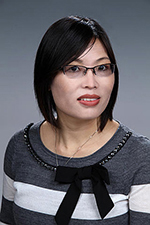 Congratulations to Dr. Jiwen Fan, atmospheric scientist at Pacific Northwest National Laboratory, who was appointed as the chair on the Editor-in-Chief Search Committee for the Journal of Advances in Modeling Earth Systems (JAMES) by American Geophysical Union Publication Committee. As the chair, Fan will lead the committee to recommend candidates that will develop the reputation and strategy of the journal. She will fulfill this role until a candidate has been chosen. Fan received her Ph.D. in atmospheric sciences from Texas A&M in 2007. Her research expertise ranges from atmospheric chemistry, aerosol formation, to convection and cloud studies. At PNNL, her primary focus is on aerosol-cloud-precipitation interactions using sophisticated modeling tools in combination with field measurements from the U.S. Department of Energy's Atmospheric Radiation Measurement (ARM) program. She is also active in serving on the American Geophysical Union committee, as well as Chair of American Meteorological Society's Chemistry Committee. JAMES, a journal of the American Geophysical Union, publishes open-access research articles focused on advancing climate science.